Who is ready for all the delicious pumpkin recipes? I know we are. 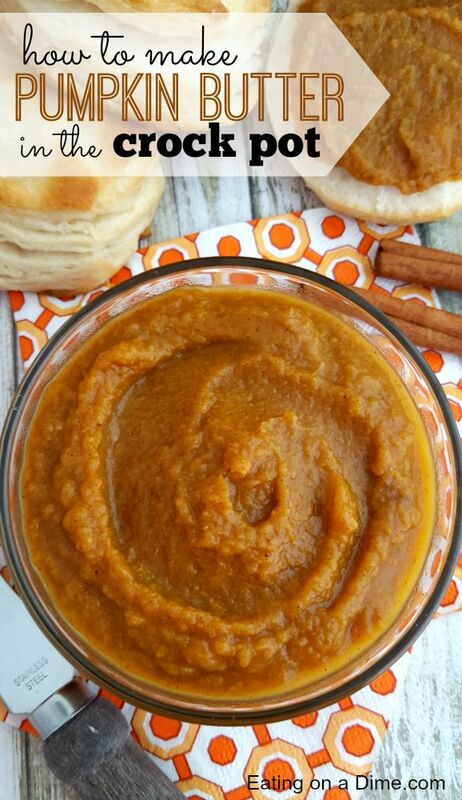 We love to make this crock pot pumpkin butter recipe and serve it with our homemade biscuits. YUM! This recipe is super easy to make too. You just toss all the ingredients in the crock pot and let the crock pot do its thing! You can’t get much easier than that? Anyone that loves Pumpkin will love this recipe. Homemade Pumpkin Butter is the best! 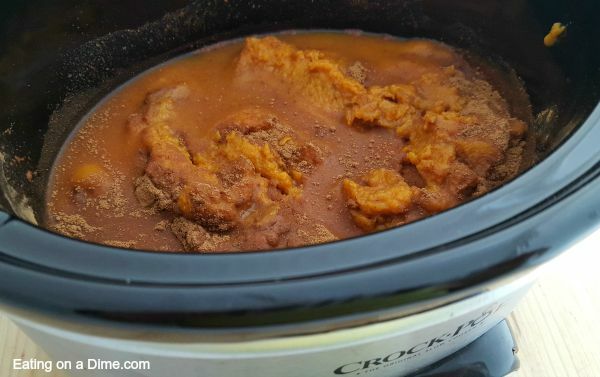 We love Crock Pot Pumpkin Butter any day of the week! It is perfect for special occasions like Thanksgiving but really you can serve it on a regular day because it is so easy to make. It’s perfect for busy school mornings when you need to jazz up plain toast. Yum! We all love it. 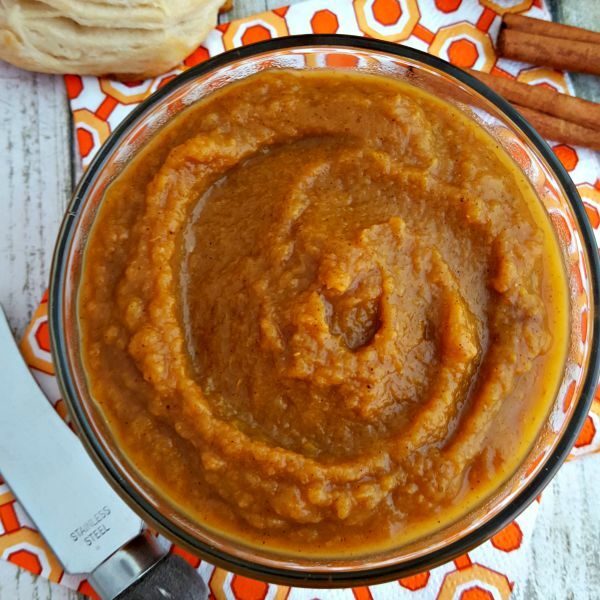 If you love Apple Butter Recipe, I bet you will enjoy this delicious Crock Pot Pumpkin Butter. Can you freeze pumpkin butter? Yes! This delicious pumpkin butter recipe may be stored in the refrigerator for up to one week, or freezer for up to 6 months. I try to keep some in the freezer at all times because we love it that much! It’s so simple to make and is so delicious. Not to mention your house will smell amazing while this is cooking!! Let’s make Homemade Pumpkin Butter! 2 15 oz. 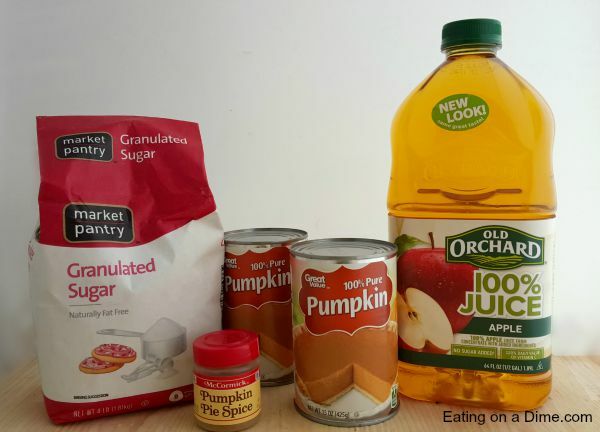 cans Pumpkin – You can also easily make homemade canned pumpkin, too. How do you make pumpkin butter? 1. Combine all ingredients in the crock pot, and set temperature to low. 2. Allow to cook for approximately 5 hours stirring occasionally. 3. Spoon pumpkin butter into jars and let cool completely in the refrigerator before using. This make a great pumpkin spread. You will see different variations for this recipe. Some people add apple cider instead of apple juice and lemon juice and maple syrup. Or Brown sugar instead of white sugar. We prefer it just like this recipe and it’s always a hit. Now that you know what is pumpkin butter, what can you use it on? Try it on pancakes or waffles. Try it on homemade biscuits. Try it on regular toast. Try it on french toast! Oh… what about a peanut butter and pumpkin butter sandwich. Ok.. I think I’m going a bit overboard about this, but I think you can see that you can use this delicious pumpkin butter several different ways. Can you can pumpkin butter? The USDA does not recommend canning pumpkin because it’s hard to get the temperature for proper canning due to the density of the butter. It is best to freeze pumpkin butter for long term use. Years ago there was a Pumpkin Butter Canning Recipe but it has since been changed due to the USDA no longer recommending this method. It can be stored in the freezer up to 6 months. Keep in mind in the refrigerator it is good for up to one week. Ball has freezer jars that are perfect to freeze this Pumpkin Butter in. My favorite feature is that you can lock the lid down. This is awesome if you have to move the crockpot. There are several others on sale here. Another favorite is this programmable crock pot for when I am am not at home all day. I also like to use crock pot liners to make clean up a breeze. These are worth every penny and save a ton of time. This is especially helpful during busy weeks of school and activities. I’m all about crock pot liners. 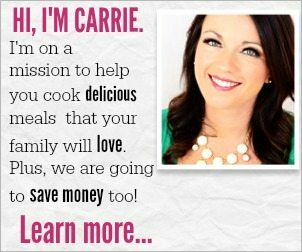 It’s so convenient using your slow cooker because there is no need to stir frequently or worry about remembering to reduce heat. No one has time to babysit a recipe every 20 minutes. 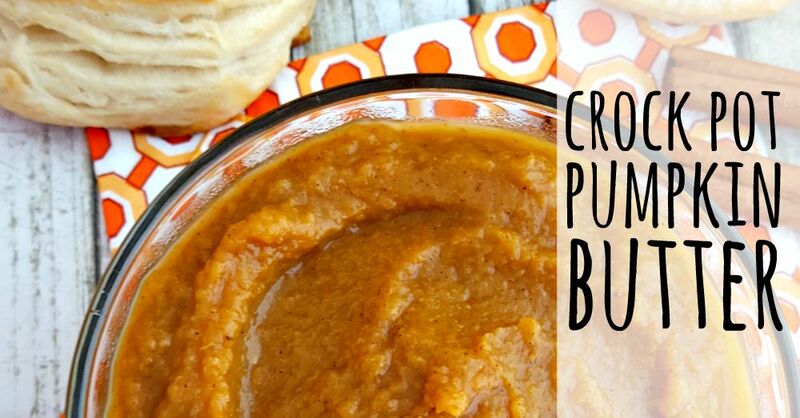 Let us know what you think of this Healthy Crock Pot Pumpkin Butter recipe! We all love it and it’s just so delicious. Plus, it is SO easy to make that I can easily make this tasty recipe. It is so yummy and also makes a great gift. We make extra to give to to neighbors and friends. It is always a hit. Making this delicious Crock Pot Pumpkin Butter has actually become a tradition. We make it each and every Fall. My friends know that they will get a jar and it’s become a fun tradition. The kids help and we all make this together. It’s so fun and easy! Plus, I love how amazing the entire house smells as this is cooking. Sometimes, we make Pumpkin Butter from Fresh Pumpkin. It’s very simple and I actually keep Pumpkin Puree in the freezer. It is very handy to just grab from the freezer. I often make a double batch just so I can have extra in the freezer. We love all things Pumpkin so it never goes to waste. I love making pumpkin cookies , Pumpkin Bread Recipe and even pumpkin pancakes! As you can see there is always a delicious recipe to use this Pumpkin Puree in. You can also learn how to make pumpkin pie spice at home when you don’t have any on hand. It only takes a few minutes to make and it’s so easy. Plus, it saves a ton of money from buying store bought. 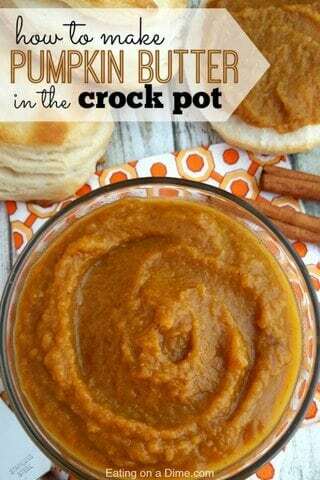 This Crock Pot Pumpkin Butter Recipe is so easy to make. It is the perfect pumpkin recipe for Fall. Your family will love Homemade Pumpkin Butter Recipe. 2 15 oz. cans Pumpkin See how to make pumpkin puree. Combine all ingredients in the crock pot, and set temperature to low. Allow to cook for approximately 5 hours, stirring occasionally. Spoon pumpkin butter into jars and let cool completely in the refrigerator before using.